Of course, “best” is subjective; these are just my ten favorites, presented more-or-less in order of publication. Click on the title of any of the cartoons to see a transcript of that cartoon. If you like these cartoons, and can spare it, please support my Patreon! Every $1 pledge means a lot. I really like the drawing in this one. The simple colors work well (actually, the colors here are my favorite of any cartoon I did in 2017), and the ultra-cartoony figures are expressive and fluid. Panel 3 is a good crowd scene. 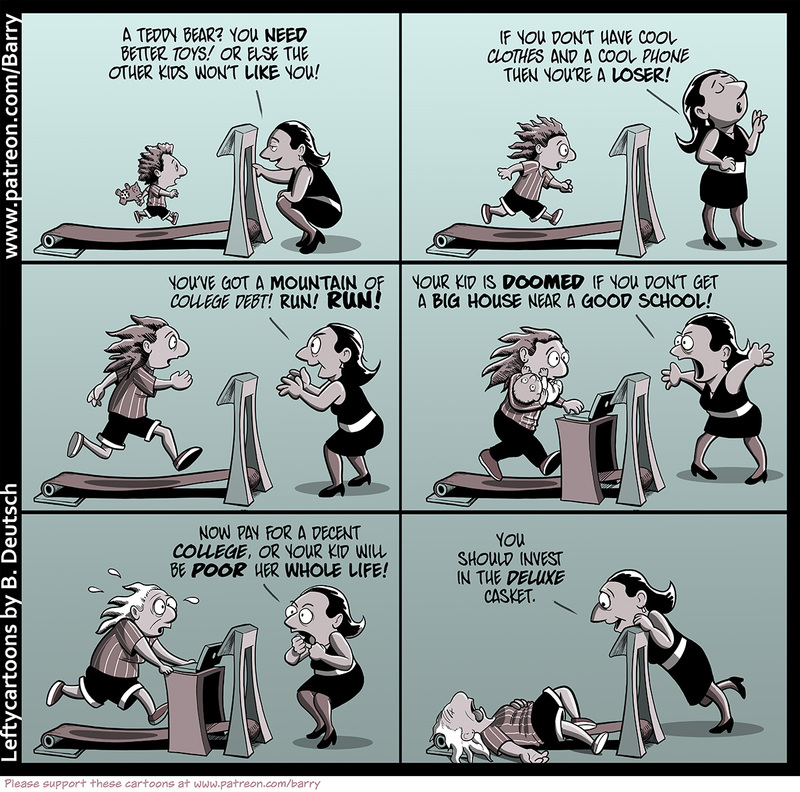 Fat acceptance is a topic dear to my heart, and perhaps because of that, it’s hard for me to write cartoons about it. So I’m happy with this one. I’m also happy with the sketchy art; although I really love sketchy cartoon art, I usually can’t manage to do it well enough. This time I think I pulled it off, especially in the final panel. I like this one, frankly, because it’s so vicious. Nothing makes me angrier with Republicans, and more skeptical of their commitment to democracy, than their ongoing attempts to make it harder for Blacks to vote. I wish I hadn’t screwed up the body proportions in panel 4. All the other characters in this cartoon have super-tiny bodies, like Peanuts characters, but in that panel I forgot and drew the characters with closer to normal human proportions. #4: Think of the Children! This one is a collaboration with Becky Hawkins, who did the drawing, except I did the colors. I like this one’s art a lot; it’s so much fun for me to see Becky’s take on my layouts. 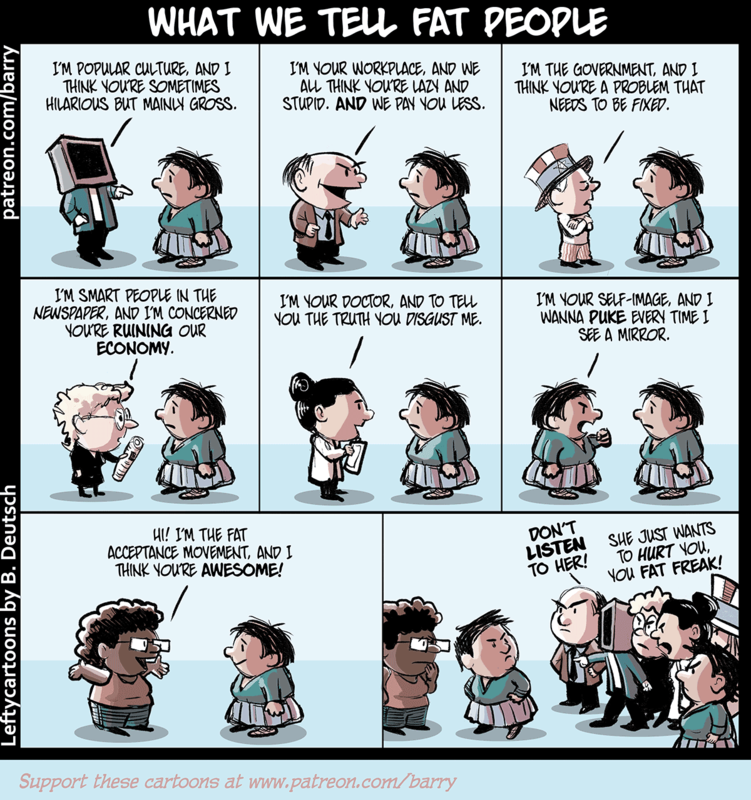 And the color scheme works really well (imo) and makes this cartoon fun to look at despite the depressing subject. Looking at it now, the one thing I’d change is I’d ask Becky to alter the hair of the speaker in the “today” panel, so his hair can’t be mistaken for a yamaka. (Although the second panel he appears in makes it clearer it’s just his hair). As for the point, I think it’s solid. This sort of bigot really hasn’t changed anything but their targets. I just plain like this one (even though it has my least favorite art of the top ten); I should do anti-consumerism cartoons more often. The background color of this cartoon keeps changing, because every few months I look at it and think “this would look better in another color.” Truthfully, it’s probably the art that’s the problem, not the color, but redrawing would be way more effort than changing the background color, so there you go. Most of this cartoon was completed before 2017 – but I expanded it in 2017, adding four panels and redrawing some old panels, so I think it counts. 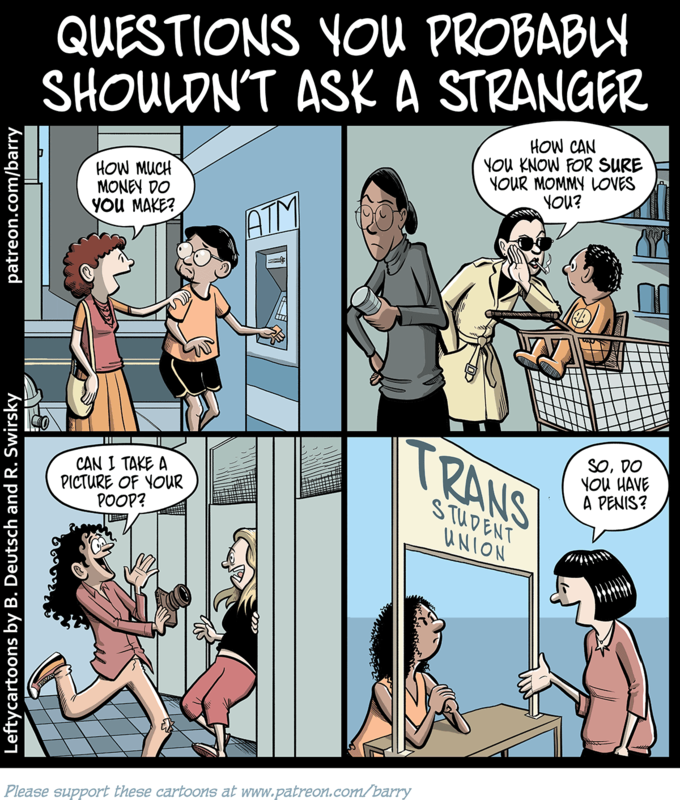 Only one other cartoon I did this year got an angrier response than “Annoying Anti-Feminists” did. I’ll tell the truth: That angry response rather pleased me. I also think it’s a good cartoon, well drawn and on target. This genre of cartoon – I did a similar one years earlier, about libertarians – takes after Matt Groening’s “Life In Hell” comic strip, which I read religiously in the 1980s. 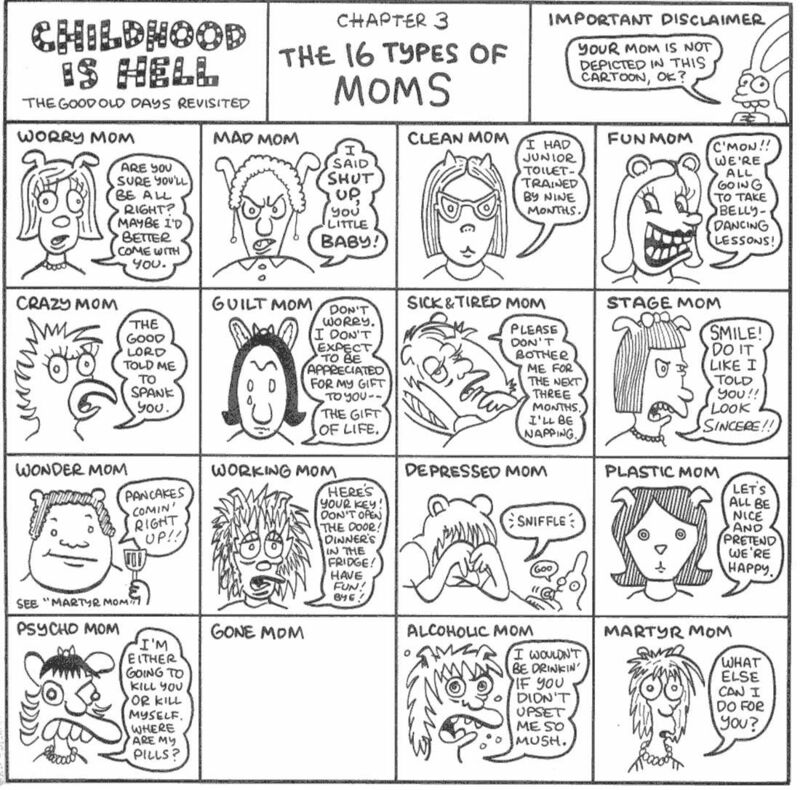 He would sometimes do these list strips, like “The Sixteen Types of Moms,” and I clearly stole the format. As you might expect, this one took forever to draw. I like many other cartoonists’ one-panel cartoons, but I find the form very hard to write myself. But I’m pleased with how this one came out; it concisely describes a dynamic I see constantly in intra-Democratic conversations. It’s reasonably well-drawn, too. This is probably the most popular cartoon I did last year, and without a doubt the funniest. I really enjoy the art, too, although it was odd to spend all that time drawing variations of myself. Kudos to Mandolin for suggesting I do a time travel cartoon featuring my Nadar-loving youth. This cartoon was actually written by Mandolin, who is just about the only person whose scripts I’m willing to draw. 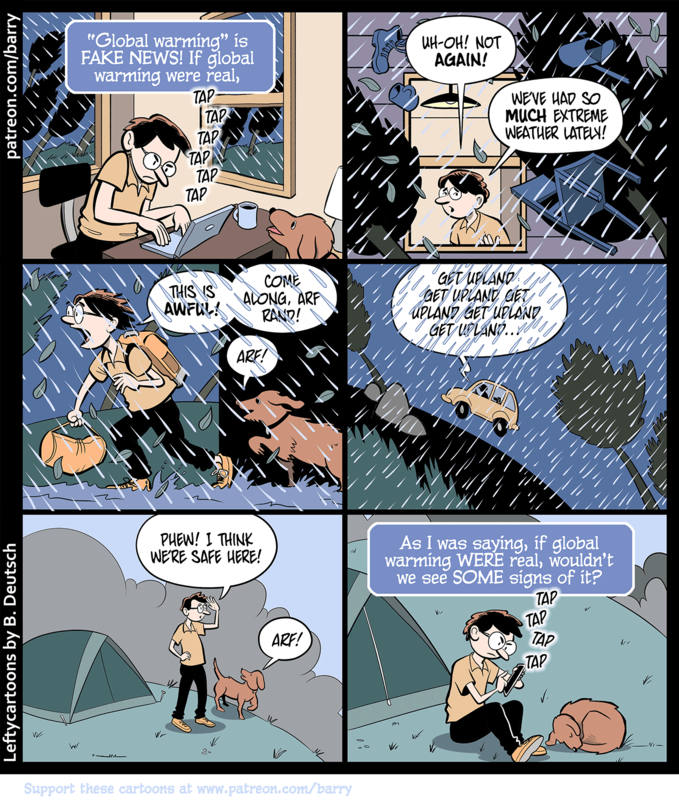 This is one that got modified a bit due to the discussion here on “Alas,” to make it clear that the character is referring to a series of extreme weather events, not just to this one event. I also put the raindrops in front of the word balloons, which is a change I love. I like this one: I think the layout and panel-to-panel storytelling is more energetic and interesting than usual for my cartoons. Plus, the dog’s name still cracks me up. That’s it, my ten best of 2017! (In my opinion, anyhow). I hope you enjoyed them, and I hope to do as good or better in 2018. If you enjoy these comics, and you can spare it, please support them on Patreon. Even $1 matters a lot to me. I’m looking forward to doing this again in a year! Your cartoons are so poignant. Keep ’em coming. Its not if government wants to fix obesity but HOW its going to do it. In Finland Health Education has given somewhat positive results as for now the graph has somewhat folded though its not yet clearly descending. There are allegations that there seems to be a fair amount of “Not Yet Over High School” in the upper levels of Silicon Valley – and they’re using their power to make up for lost time. While not exactly “Can I Take A Picture Of Your Poop” there was an incident down at the University of Illinois that got a professor there arrested. There’s some excellent arguments against using the “Chief Illini” mascot, but following people into a bathroom while you’re holding a device you’ve been using to record them is not a good way to advance them. As far as “Don’t You Feel Silly Now?” – I don’t have to wait 4 years, I already know it’s silly. I knew it was silly before the election, for that matter.